History has not been kind to General George Armstrong Custer. Yet, this often-vilified cavalry officer and Indian fighter who met his Waterloo at the Little Big Horn River in Montana in 1876, evidently had some redeeming qualities. He was devoted to his wife Elizabeth (Libbie) Bacon Custer, who defied her parents to marry him and then followed him to army camps and forts across the western plains. He was also a dog lover and often traveled with a pack of several breeds including Greyhounds. While stationed in Kentucky between assignments in Kansas and the Dakotas, Custer wrote a series of articles for Galaxy magazine entitled “My Life on the Plains.” These were later compiled into a book from which the following excerpts were taken. Following a tour of duty in Kentucky, Custer was again assigned to the West — this time to the Dakotas. It was from Fort Lincoln in June of 1876 that he left his wife behind and headed to Montana and his date with destiny. Libbie Custer was then thirty-four years old and would survive her husband by fifty-two years. To supplement her army pension, she lectured and wrote magazine articles and books about her experiences on the frontier with her husband. In Tenting on the Plains, Libbie provides several entertaining tales about Byron, a greyhound who was jealous of her and who disliked sharing Custer’s affections. Another letter dated July 15, 1874 also mentions Tuck. 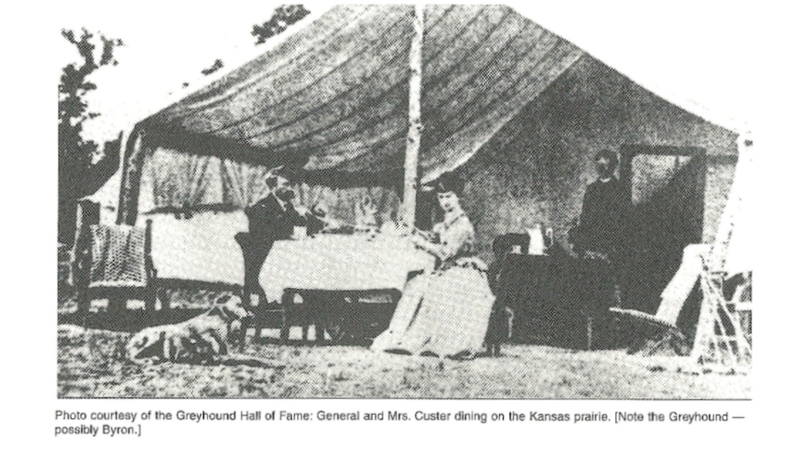 What happened to Custer’s greyhounds? One report has them sent back the night before the battle to the supply train with one very lucky soldier. Another has them in the care of an orderly by the name of Kelly who later settled in Dodge City, Kansas with some of Custer’s hounds. Did Tuck mourn her lost master? We would like to think so. CG SP 99 ALL RIGHTS RESERVED This article and any photos or artwork contained within may not be reproduced or reprinted without express written permission from the author, artists, and/or photographers. After the millions of words written about General Custer before and after the Battle of the Little Big Horn, I don’t recall having read or hearing anything about his love of Greyhound dogs. We have here the root of a trivia question for the ages. This discovery made my day!